Just as robotic lawn mowers are slowly etching themselves firmly into the echelons of the lawn mower market, so too are other technology heavy innovations beginning to transform gardening as we know it. One of the more interesting (and potentially quite useful) applications of technology in the garden is what’s become known as ‘smart monitoring’. If you aren’t lucky enough to be blessed with the natural intuition of knowing what to plant, and where, then this could be for you. In essence smart monitoring is composed of two key elements; your smart phone/tablet, and a sensor unit. Once you’ve earmarked a spot in your garden or within your borders as a place for new plants, it’s simply a case of plonking the sensor in that spot for a few days, during which time it will gather data on that spot with regards to precipitation, sunlight, and soil quality among other variables. The data collected is then fired off to the app, which then processes the information and (in theory) presents you with a list of options of what the best plants are for that area of your garden. It’s an absolutely fantastic concept in theory, although it must be said it’s very early days for the technology at the moment, with reports from early adopters of the technology being mixed at best. 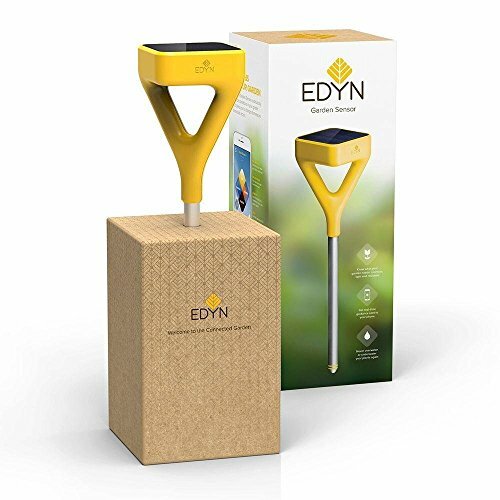 One of the pioneers in the market are Edyn with their Wi-Fi Garden Sensor. The unit itself looks the business, and the data it gathers is reportedly pretty useful, although some people have had issues of data being skewed, presumably due to the sensors being faulty or contaminated somehow. The user interface on the app looks great, and the data it presents is simple to interpret. If we were to recommend buying such a unit though, we would suggest waiting until sufficient improvements have been made to the design of the sensor unit such that the data becomes more reliable. Still, it’s a great concept, and one that’s full of potential. In the case of the Edyn device, there is already a separate auxiliary device available that connects to your garden sprinkler. Effectively a computer controlled solenoid valve, this device monitors conditions in order to deliver just the right amount of water to your lawn or garden, at the right time. Very clever indeed. So there we have it. Smart Garden Monitoring at a glance. This is certainly an area we’ll be keeping a close eye on, with further reviews and investigation coming in the future.